Want To Solve The World's Most Heated Disagreements? Bring Your Wallet Research found that a little cash goes a long way toward making people more thoughtful about what motivates their longtime foes, be it Israelis and Palestinians or Republicans and Democrats. 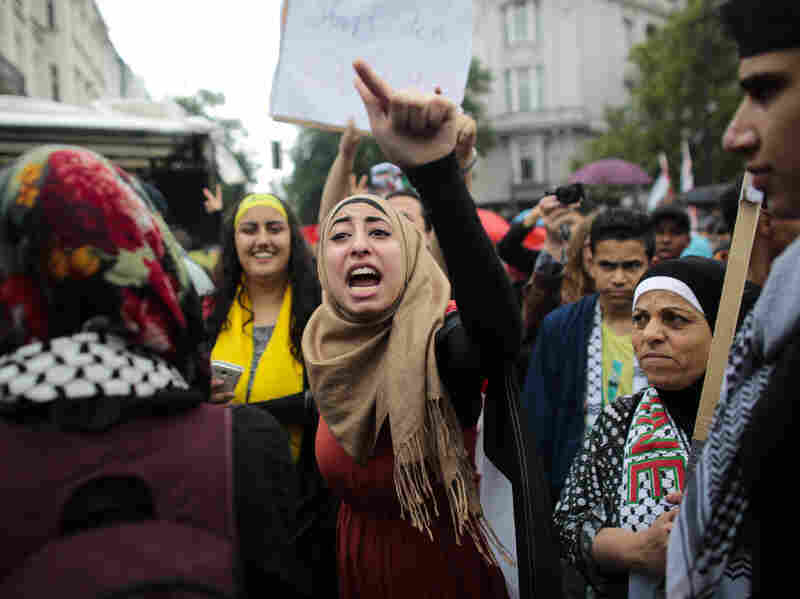 A woman shouts slogans as she attends a pro-Palestinian rally July 25 in Berlin. About 1,200 pro-Palestinian demonstrators marched through Berlin amid high tensions over Israel's actions in Gaza, while some 700 protesters took part in two counter-demonstrations. 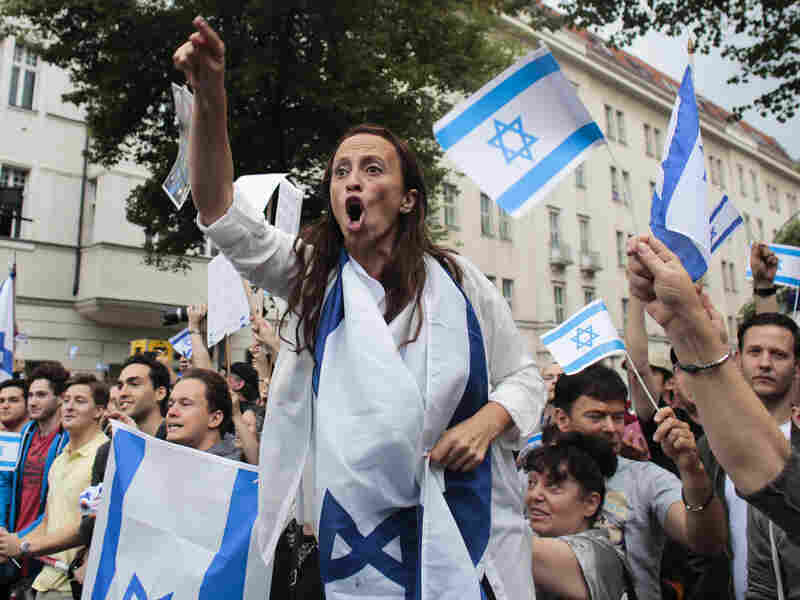 Pro-Israel demonstrators shout slogans July 25 while protesting against a pro-Palestinian rally in Berlin. About 1,200 pro-Palestinian demonstrators marched through Berlin amid high tensions over Israel's actions in Gaza, while some 700 protesters took part in two counter-demonstrations. Conflict between Palestinians and Israelis or Republicans and Democrats appears intractable in part because of one fundamental bias: We misunderstand the other group's motives. When Republicans attack Democrats, Democrats think they're motivated by hate, but Republicans believe they're motivated by love and "in-group" loyalty. And vice versa, of course. Everybody and everything has a price — including empathy. That's according to a study published online in Proceedings of the National Academy of Sciences earlier this year. The research explains why negotiation and compromise sometimes is so difficult, but the also shows that simply getting paid can make people more empathetic. By rewarding accuracy with cash, "people think more carefully and critically about their beliefs" and come to different conclusions, says study co-author Jeremy Ginges, an assistant professor of psychology at The New School. While financial incentives could be seen as inappropriate or even "insulting" in some contexts, the idea that creative interventions can change bias, improve both parties' willingness to negotiate and encourage optimism for good outcomes is a very significant finding, says Ginges. The vast majority of Palestinians believe the latter — on a scale of 1 to 4, where 4 is "certainly yes," they registered 3.38, on average. At the same time, Palestinians believe the central motivation for rocket attacks on Israel was a love of Palestine (3.34). Results for Israelis on the questions went strongly the other way, and U.S. Republicans and Democrats felt similarly about the motivations of their own group and their opponents. But what to do? First, Ginges and co-authors Adam Waytz and Liane Young tried a soft push: They asked Republicans and Democrats to put themselves in the other's shoes. That had no effect, says Ginges. But when offered $12 for being more accurate, righties and lefties alike took a look in the mirror and found empathy. The bias was flipped on its head — subjects were more likely to think the other group was motivated by "in-group" love rather than "out-group" hate. So throwing money at intractable disagreements works? Other studies give a cautious "yes." While this study may be the first to test financial incentives on conflict-motivation bias, it's not the first to measure how cash rewards affect empathy. After showing that women were more empathetic, a University of Oregon study published in 2001 was able to even the playing field by offering both men and women monetary rewards. So, men just need more incentive to empathize. Naturally, further research is needed: "We want to identify which incentives work best and when," says Ginges. Offering your spacey boyfriend money to listen to you, paying senators to compromise or compensating Palestinians and Israelis for coming to the negotiating table may sound crass — but it might work where nothing else has.